This article contains 18 photographs. Please allow time for them to arrive! 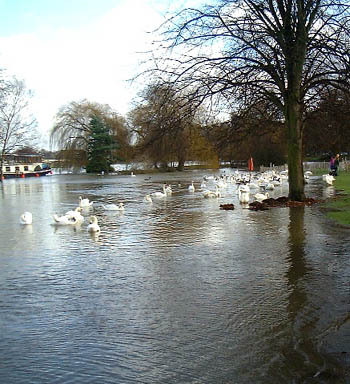 Just over one month ago in the first week of November the UK was suffering some of the worst and most widespread flooding for 50 years or more. 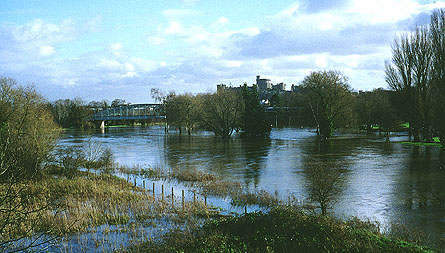 Yorkshire was suffering, the Severn Valley was inundated as well as many parts of Kent and Sussex. The Midlands were not spared either. 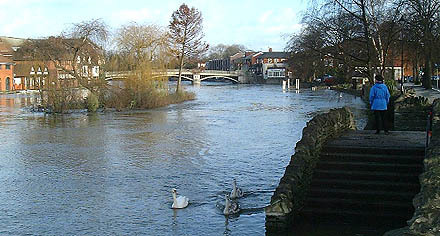 Yet here in Windsor, although the river was high, and even though some properties in Maidenhead were affected in the Ray Mead Road area, no inundation occurred in this area. One month later and the river is in flood once more. 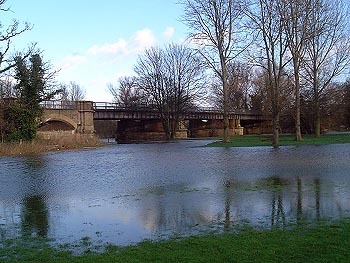 It is true to say that the river level had not actually returned to normal at any time in the last four weeks but at least the river's height was contained within its banks. 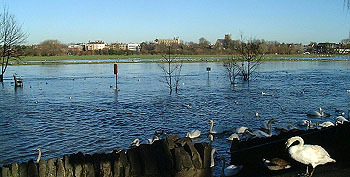 Now the river has burst its banks once again and river levels forecast to continue rising for the next few days. 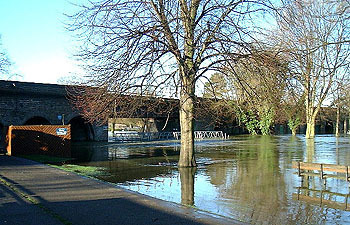 This week river levels are higher than November by some 6" or so. The following photographs were taken in the course of this week and will be added to in the event that the river rises significantly. No threat to housing exists in the Windsor area at this time. 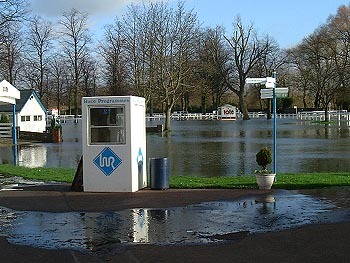 The river has risen 2"-3" in the last two days, and is now approximatelky 3 feet above normal, sufficient to flood The Brocas on the north side of the Thames although roads and property in the area remain above the river level. 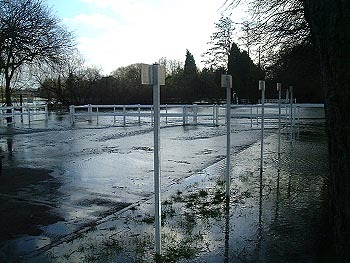 Experts are predicting that, with the ground saturated, severe weather at any time through the winter could well cause a reoccurrence of increased river levels from time to time. 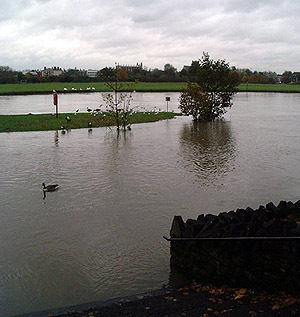 The severity of the rainfall, and the intervals between each period of bad weather, is obviously critical to the potential for future flooding. 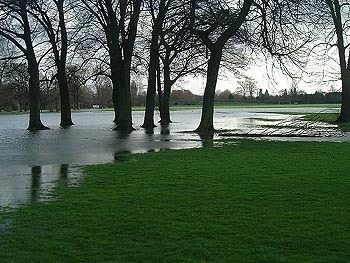 From The Promenade at Barry Avenue. 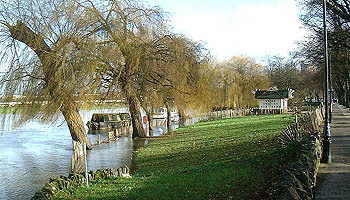 Two days later, 15th December, and The Brocas on the far side of the river is inundated. 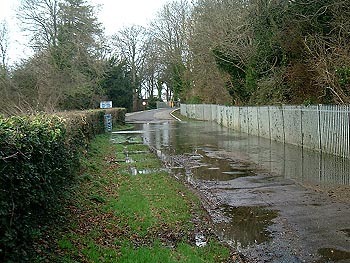 The water begins to flood The Brocas. now under almost two feet of water. 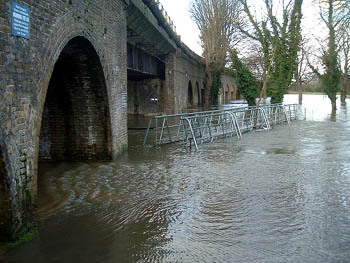 Water streams through the Great Western Railway arches. 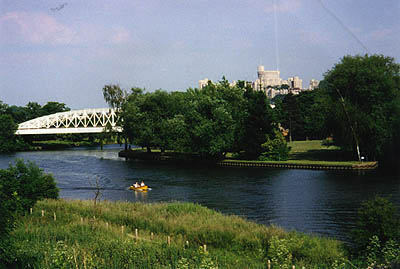 The view downstream from The Great Western Railways arches. Two days later and the river has risen by some 4" inches. 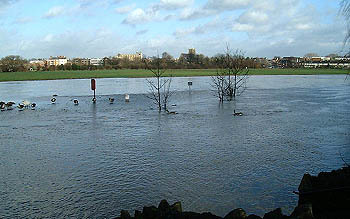 Upstream from Brunel's 'Bowstring' Bridge, the flood water has covered Baths Island. 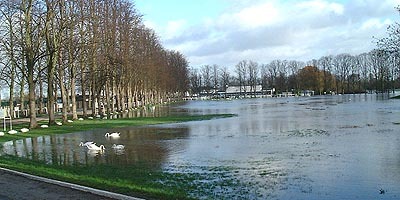 The river encroaches onto the eastern side of The Home Park, Windsor.